New look for Honda Civic | What Car? Hondas Civic hatchback is getting a new look for 2011. The most obvious change is at the front, where all models get a new nose, inspired by that of the discontinued Type R hot hatch. Sporty-looking Type S models also have colour-coded sideskirts, while a new colour Ionised Bronze is available across the range. Every model receives new-look alloys, too 16-inch wheels on the 1.4-litre and 1.8 SE versions, and 17-inch designs on the 1.8 Si. 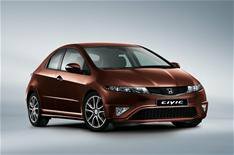 Honda has also revised the Civics interior in an effort to make the car more comfortable. SE and ES models are now trimmed in a mixture of fabric and Alcantara, while Si models have a leather/Alcantara mix and heated front seats. Despite the changes, there is no increase in cost, with the range starting at 13,995 for a 1.4 Type S.